The Lakewood Historical Society will dedicate its next historic marker at the Old Settlers Cemetery at 8105 Washington Blvd SW, on Friday, April 24th at 4 pm. Mayor Don Anderson and other City of Lakewood officials will be in attendance. Parking is available on 83rd Ave SW along the western border of the cemetery. The Society will also recognize and honor Len Castro who completed his Eagle Scout project last year in the cemetery. 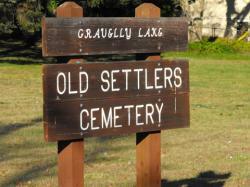 He placed a kiosk and plaques with the names of the people buried in the cemetery, many of whom are early pioneers of the Steilacoom and Lakewood communities. In 2009, Len’s brother, Leavitt, installed the chain link fence that surrounds the cemetery for his Eagle Scout project. The Society has been placing historical markers in Lakewood since 2002 (complete list). The event is FREE and open to the public. Refreshments will be served. Call 253-682-3480 for more information.